Browsing the latest projects in KickStarter, I found this set of two packs of cards. Both have been made by extracting parts of US and Chinese banknotes. The result is quite appealing with lots of elegant details on an intricate background pattern. The pip cards are not shown in the crowdfunding project page therefore I guess they are not illustrated. More than 1000 people made this project a successful campaign. This is probably due to the success of the precedent pack “Federal 52” (2013). 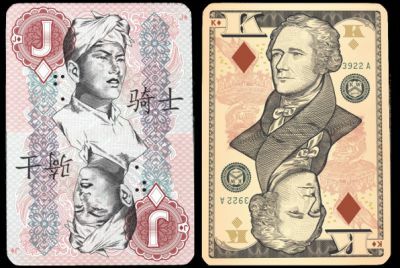 Those currency inspired playing cards have been designed by Jackson Robinson. Choosing US and Chinese currency may be related to the fact that both countries have a dynamic group of playing cards collectors.